I call it creepy, suspenseful and delightfully addictive. One book you can’t put down. 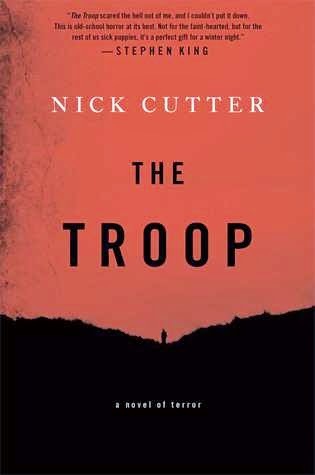 Nick Cutter’s The Troop has all the bone-chilling horror elements to keep you on the edge of your seat. Then one night a haggard stranger in tattered clothing makes his way to the island on a boat, and collapses on the campers’ doorstep. Will dependable Tim be able to protect the boys? Before the night is over this shockingly thin stranger with an unusual hunger pangs, will end up infecting one of the troop’s own with a bioengineered horror that’s straight our of their own worst nightmares. What entails is a harrowing struggle for survival. Will they all be infected? Will someone come to save them? Will group dynamics be questioned? Will they eventually survive? Nick Cutter has done a phenomenal job developing his characters and the storyline side-by-side with the overarching theme engaging all our senses. His beautiful interrupted story-telling format enhances the reading experience. The Troop has been categorized as part Lord Of The Flies and part 28 Days Later, and with a perfect pace and beautiful dialogue and character buildup, it’s one of the best disturbing novels that I’ve enjoyed in a long time. A truly lovely Canadian horror gem. The Troop is published by Simon & Schuster Canada. You can follow author Nick Cutter on twitter. I think his books are made for movie adaptations. They are vivid in their descriptions yet stylistically have the contextual gravity missing from the superficial "YA" novels that are popular today. They sure are. I had a conversation with @TheNickCutter on Twitter and asked him about any movie adaptation. He didn't confirm anything...but said he would announce it on Twitter when it happens. Between you and me, I feel like it's gonna happen. As you said, "They are vivid in their descriptions yet stylistically have the contextual gravity missing from the superficial "YA" novels that are popular today." Although, Hunger Games (A YA novel) translated beautifully to the big screen with all it's depth and glory.